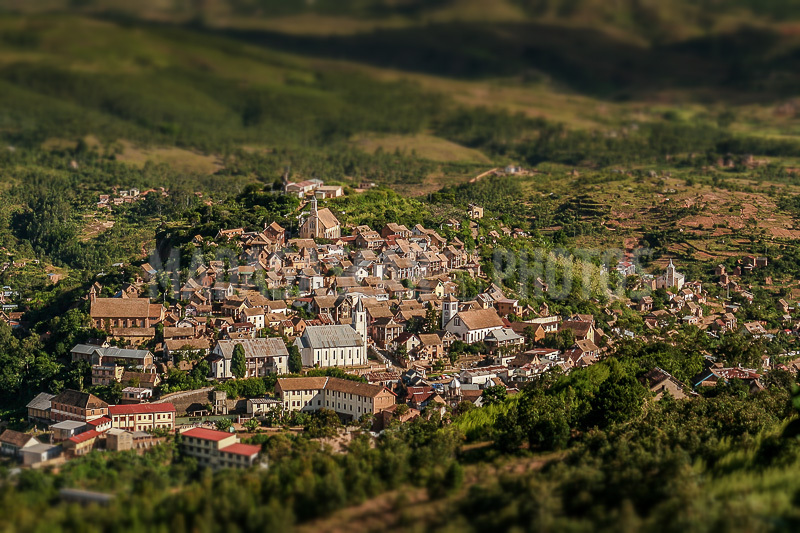 "Where the good is learned"
Philippe Oberlé, who wrote several books on Madagascar, introduced Fianarantsoa as follows: "As in Antananarivo, the old quarters climb on a steep hill at the foot of which a cathedral-dominated square extends, Anosy lake shines on the foot Of the cliff. The capital of the Betsileo spreads like its elder sister on several hills and on a vast plain where the city develops." The county town of Fianarantsoa was founded in 1830 by order of the Queen Ranavalona 1st at the site of an ancient village Betsileo. Its name means "the place where one learns the good" and the city brings it well by the reputation of its university. Its configuration echoes Antananarivo. Like the capital, it has its Lake Anosy, its Upper Town, its staircases, its alleys and its houses with wooden verandas and brick columns. Fianarantsoa even has its railway line connecting it to the East Coast, whose terminal station inaugurated in 1936 represents an architectural masterpiece. The first plan of the "modern" city was designed by Lyautey, Superior Commander of the South of Madagascar from 1900 to 1902. It later apparently spread without a master plan, and it is not easy to locate where Is actually downtown. Laudable efforts must be made to the credit of the local authorities to embellish the living environment of the Fianarois, and to draw the city from this sort of introversion and austerity which it has always been associated with rightly or wrongly. The Old Town must be visited, with the labyrinth of its narrow paths, and the clutter of its houses with brick columns and tile roofs patinated by time. At the top there was once a fortified esplanade with only a few stone steps left. Adjacent to the place, the Protestant temple of Antranobiriky built in 1859 is the oldest permanent structure of Fianarantsoa. At the foot of the paved alley through the old quarter is the market square, and even more below the Catholic Cathedral of Ambozontany built in 1871. From there a road descends towards Lake Anosy while another leads to the summit of Kianjasoa from where the view embraces all the city and the surrounding countryside.